Fully furnished single level townhome that backs up to Troon Mountain in the exclusive gate guarded community of Troon in North Scottsdale. Beautifully decorated and comfortable this home away from home even has a separate office. The kitchen and open floor plan are great for entertaining. The backyard has a barbecue and patio set for enjoying the spectacular mountain views. Use this as a home base to enjoy golf at some of the best courses in the U.S. or visit Arizona's other fine attractions such as the Grand Canyon, the Red Rocks of Sedona or the Pines of Flagstaff. You won't be disappointed. 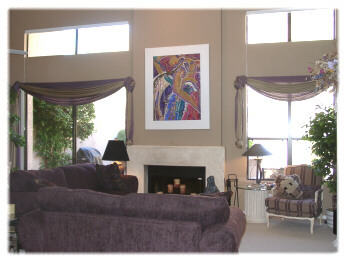 Located in Gate Guarded Golf Course Community in resort town of Scottsdale, Arizona. Great Views!-Condo backs up to Troon Mountain. Cable television in both bedrooms. Fully equipped kitchen complete with dishes and cookware. 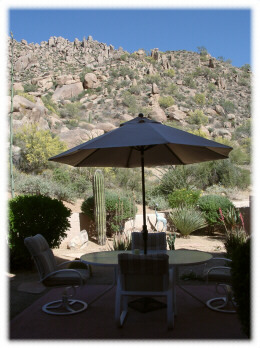 Backyard/Patio backs up to Troon Mountain, tremendous views. Den is set up as an office. Just bring your computer! Garage is small, accommodates two standard size vehicles. No overnight parking in street or driveway allowed. Community clubhouse with billiards table. Located just minutes from some of the finest restaurants in North Scottsdale. 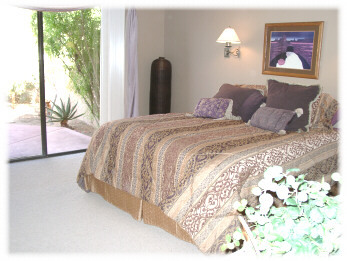 Also located minutes from the top golf courses in the Southwest, including Troon North, Desert Highlands and Estancia. Hiking trail on Pinnacle Peak just two minutes away. Special Offer: Get a 25% discount for 2004 & 2005 bookings made before November 1st.